The information presented on this page was originally released on November 5, 2009. It may not be outdated, but please search our site for more current information. If you plan to quote or reference this information in a publication, please check with the Extension specialist or author before proceeding. MISSISSIPPI STATE -- Mississippians may find themselves with many people on their gift lists and a small budget this year, but a few ideas and some creativity can help them give good gifts. 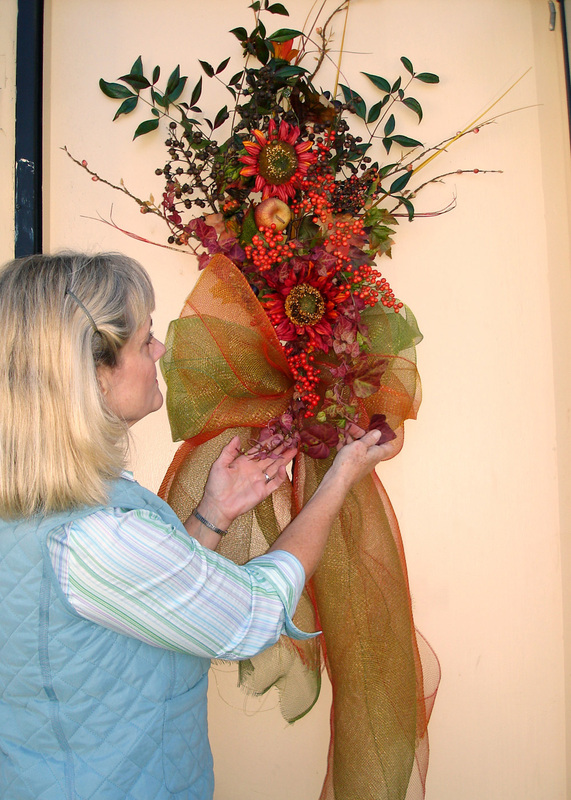 Lelia Kelly, consumer horticulture specialist with the Mississippi State University Extension Service, said people can create unique and memorable decorations and gifts at little cost using plentiful resources from gardens, fields and woods. Fresh evergreens, fruits, nuts and berries add beauty and aroma to decorations, but dried flowers, foliage and other dried items can serve decorative purposes, too. Look for interesting bare twigs, lichens, moss, nuts, berries, seed heads, grasses, birds’ nests or even old paper wasp nests to add interest to the decorations. Kelly encouraged decorators to bring along children or grandchildren to share in the experience. “Little eyes will spot things that older eyes may not notice, and their contributions will add to the memories and the enjoyment,” Kelly said. With a stack of natural crafting material to work with, it’s time to decide what to make. Kelly said crafters can make wreaths, swags, holiday centerpieces, wrapped gift embellishments and more from the materials they bring in from the outdoors. “A good pair of hand pruners, a hot glue gun, wreath bases, florist wire, ribbon or raffia, and some imagination are about all that’s needed to get started.” Kelly said. Kelly offered an important safety tip for these homemade decorations. “Never put a holiday decoration near a heat source such as a fireplace, floor vent or candle if they contain flammable materials, like plant material, which is already dry or will dry quickly in a home,” Kelly said. Carolyn Purnell, area nutrition and food safety agent in Montgomery County, said homemade gifts from the kitchen are another good holiday option for gift-givers. These gifts are also good for family members who are away for the holidays, such as those in the military. While mail-order companies make holiday food gift-giving easy, these sometimes do not have the same appeal as something baked at home. “Be sure to choose foods that are not perishable, can handle extreme temperatures and won’t break easily,” Purnell said. While those standards seem like big demands, many foods meet these conditions. Purnell said dried foods, jerky, condiments, low-moisture breads and cakes, cookies, candies, flavored coffees, teas, cereals and nuts all are candidates for edible gifts that also can be shipped. When shipping foods, careful packaging is important. Stack flat cookies back to back in pairs with a sheet of waxed paper between them, then wrap in foil or plastic wrap. Pad the bottom of the container with crumpled wax paper, and place heavier cookies on the bottom. Make sure the lid on the shipping container fits tightly. Leave bar cookies uncut and in the baking pan or place in a box that is the same size as the baking pan, wrapped tightly in foil or plastic wrap. To send low-moisture cakes, select a box that is slightly larger than the cake. Find gift-making instructions online at http://extension.msstate.edu/lawn-garden/herb-gardens/herbs-gifts.